Ararat Rural City Council kicked off National Volunteer Week 2017 with a Reception hosted by Mayor, Cr Paul Hooper at the Alexandra Oval Community Centre on Tuesday night. THANK YOU: Ararat Rural City Council Mayor, Cr Paul Hooper with 2017 Volunteer Award recipients. Among the crowd of 80 were fellow councillors Gwenda Allgood and Peter Beales, Ararat Rural City Council CEO, Andrew Evans and Council Officers, with the Ararat City Junior Brass Band providing entertainment on the night. “We recognised people from across all sorts of volunteering, from clubs to emergency management and those who care for key community assets,” Cr Hooper said. 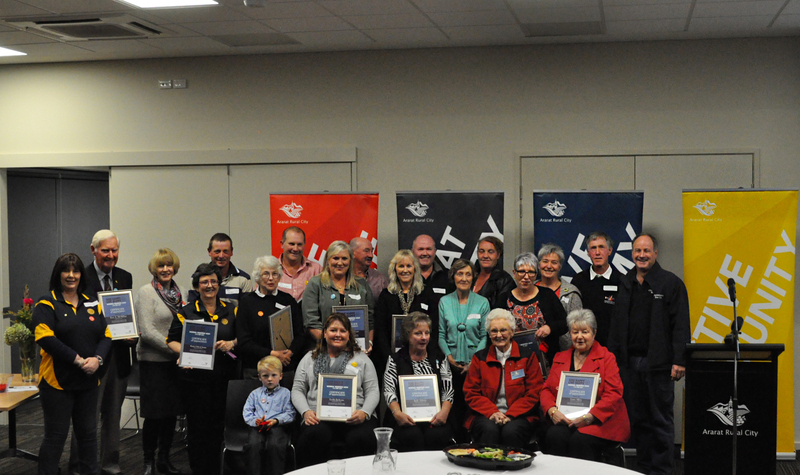 In April the Ararat Rural City Council called for nominations from the community for people they thought deserved recognition for volunteer work and as a result 19 presentations were made at the function. The recipients were: The Rotary Club of Ararat, Judy Aldous, Gaye Allen, Aileen Banfield, Harry Calderbank, Jane Richardson, Cheryle Stapleton, Lydia Jackson, Ross Jackson, Trevor Keilar, Ivor McMillan, Tricia Ruthven, Roger Spratt, Sarah Stacey, Tom Stapleton, Madelene Townsend, Lyndee Bond and Mick Davis. This year Ararat Rural City Council offered three categories that people could be nominated in, Volunteer Encouragement Award, Organisational Nomination and the Quiet Achiever Award.